← Are your clients part of your design team? Do you want them to be? Last week I headed down to Melbourne for Worktech 2014 . It is the first time I have attended a Worktech event , going based upon a few great recommendations – I had been told it was the best workplace event in Australia. I wasn’t disappointed. As well as getting a peak inside of NAB’s new 700 Bourke St at Docklands (which was the event venue) the presentations were generally of a very high standard – great presenters with relevant and focussed material. I also found it interesting to note that most of the presenters were not designers – but representing the client organsiations such as NAB, Bupa, Google, MLC and RMIT to mention a few – which sets the apart from many other workplace seminars. The day was jam packed – there were approximately 15 sessions, as well as the presentations these included a site tour and an interactive session moderated by Rosemary Kirkby. I thought rather than give you a sentence or 2 about all of them I’m going to share my thoughts on the 2 sessions I found most interesting , over this post and the next. If you see other sessions in the program and wonder what they were about – feel free to comment, tweet or email me and I am happy to share further thoughts. Philip Ross is a workplace futurologist at Ungroup, and so not surprisingly, he was talking about the future of the work in a presentation which he described as being about Jellybean Working. At first I wondered what the reference to jellybeans might mean, surely not the fad for jellybean shaped desks, but as I got interested in his talk the reference to jellybeans faded into the background. Although he did explain towards the end, and so will I. The main focus of Philip’s presentation was the impact that technology would have on the workplace of the future – and not a far range future, but within the next few years, technology that already exists. Whilst we are all now familiar with the idea that we work using technology tools – and that they change and update all the time, I would say less of the audience were aware of the technologies that makes up what Philip described as the next break through in the workplace – big data and real time activity tracking. Philip spoke about a range of technologies and methods for tracking activity both in the workplace and elsewhere including sociometric badging, social media and short range wireless as well as other technologies such as driverless cars which would change the way we work. Sociometric badging is an area I have been interested in since I first came across it about 12 months ago. MIT have invented a device, which they call the sociometric badge which allows you to record data about the movement and behaviour of the person wearing the badge as they move around the workspace during the day. The device is about the size of security swipe card (and can have this function embedded into it I recollect) and it contains a whole bunch of bluetooth and/or wireless sensors, motion detectors and recording devices. So not only will it track where you walk, but if you are standing or sitting and if you are talking to someone and how loudly for how long. Put very simply and crudely, through a whole lot of measures, the data then indicates who you talk to a lot, who you say hello to in passing and where and how you spend your day. The data can then be used to create social maps of an organsiation, which are now being considered important signifiers of innovation and collaboration. I could probably write a whole blog post on this topic…If you are interested in reading more, I highly recommend “People Analytics: How Social Sensing Technology Will Transform Business and What It Tells Us about the Future of Work” by Ben Waber. As Philip pointed out, all of this leads to the question of privacy. However studies are showing that privacy is very much a generational idea, and that generally younger generations have less concerns with sharing information than older generations. Many people seem to no longer care about privacy at all – Philip referred to a website ijustmadelove (which I am not linking to my blog – I don’t want to think about how much spam it might set off!) where people are choosing to share very private information. Whilst some information we are sharing by choice, other information is shared without most of us realising it. We are already sharing significant amounts of information with search engines and retailers, and not just online but a link between instore and online. Using short range wifi to allow checking into a locations via a social media application means that the next time you enter that space the retailer will know every time you are inside their store. They will also have your purchase history and your browsing history while in store. This will lead to live time direct advertising. Apple are also already using a low energy bluetooth system called iBeacon which doesn’t even require you to check in. I already have something like this happening on my phone which I think is operating via gps tracking – every time I pass the local burrito place after using an evoucher there – at this point it doesn’t offer me any deals but it does pop up to tell me I am near the restaurant. All of this eventually leads us eventually back to the jellybean. 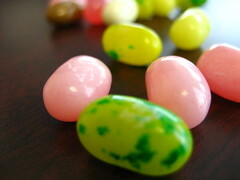 Philip uses the term jellybean to refer to the social media dot or blob that indicates if you are online or offline. He suggests this will become more important in the workplace, signaling to others where you are and what you are working on. I know in an office I worked in with an instant message network people did stop calling the phones if your greet dot wasn’t on. However in the fairly near future, not only will this social media icon just signify that you are online, the technology to concurrently edit documents with other users, will also allow it to signify who is working on a document, whilst tracking technology will identify where in space they are physically located. Philip defines “Jellybean working” as the intersection of technology, people and physical space. All of this freaks people out a little sometimes, but if you think about it, Apple and Google probably know everything about you already. Which is a nice segway into my next weeks blog post, which will be on Hayden Perkins presentation about NYC Google and Let the User Decide. Would you sign up for a sociometric badge in your workplace? What new technologies or social media platforms do you think will transform the way we work? Do you use social media in your workplace? P.S. I’m excited to announce that I’ll be presenting at RTC NA in Chicago in June in a session on a similar topic to this one – entitled BIMx:Big Ideas around Big Data. Registration for the conference hasn’t opened yet, but the RTC AUS conference registration has, it will be on in May in Melbourne and I am also presenting there – a session called Get your Groupon. Check out the RTC Events Site. This entry was posted in Clients, Events, Industry and tagged big data, collaboration, future of work, Philip Ross, social media, sociometric badging, workplace, Worktech. Bookmark the permalink. I just missed out from getting a ticket for the Worktech event in London November 2014, now sold out. You are likely to know Condeco software (link below), they have an office in Sydney. These guys are providing facilities based tracking systems that maps peoples movement enabling companies to assess building functionality and performance. But the flip side of this is that the organisation that has access to this type of data can also begin to manipulate the population with out seeking consent. I don’t think its so much a personal privacy issue for me, I guess I am a lot more concerned about corporate organisations manipulating the environment, like a farmer herding his sheep. I have in the past had a lot of experience in working with corporate organisations I have seen how they make decisions so I am naturally cautious about them. Given that they are often self orientated, very fickle, and not always ethical I am sceptical about how they would use these technologies – It may be a force for BAD for those working for them. Designers will soon be be faced with only data as the requirements with the brief that they are to change the data to something else. At that stage it will be all about “oiling the corporate machine” and a lot less about “working environments for people”. Sociometric tracking has very interesting implications for my end of the design process. It could be linked to the BMS and used to direct the fresh air & cooling to where people actually are. More accurate and more responsive than relying on CO2 sensors I suspect. It could also save on operating costs by turning down the plant when few people are in the office. In response to John. Technology can be used to control and manipulate, or to release and empower. I think employers who choose the former are already finding it difficult to attract and retain the kind of staff that are needed to remain competitive in today’s business environment. John and Kevin. Thanks for reading and commenting. I agree that it is likely that any available technology would be used to manipulate the environment – this is already done in many environments in many ways – I’ve written a bit about it before http://themidnightlunch.com/could-good-design-make-us-smarter/. I think its also a sure thing that large Corporates will do what benefits them – however right now in design terms – a lot of organisations are realising what benefits them most are happy and satisfied staff. And the other interesting aspect is that perhaps they would actually benefit the people who are connecting, working and making things happen at the lower levels in organisations, not just those managers get up and talk a lot and take a lot of other peoples credit, without actually achieving anything. As you noted Kevin, the Sociometric badging and real time activity tracking have lots of great possibilities for building and facilities management, both from environmental and operational sides – as well as from the people side of things.